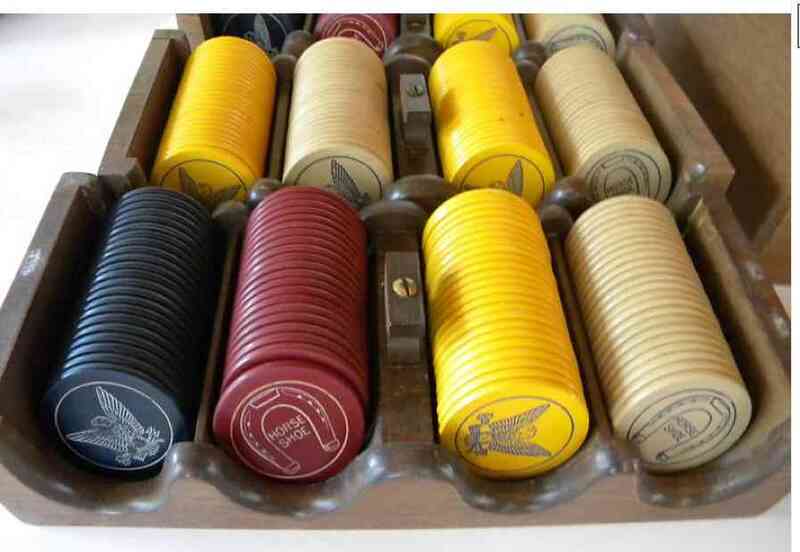 ¶ each column/stack in the rack holds at least 25 standard round-edged poker chips, or 24 or 25 thick square-edged inlaid chips. Thus, 8-column racks hold approximately 200 chips, 12-column ones hold some 300 chips, etc. 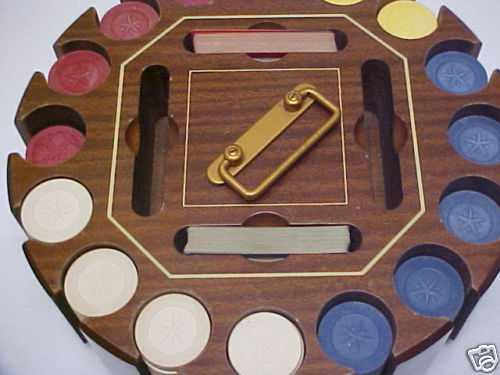 ¶ the columns can accommodate standard club gambling chips of 40 mm (1-9/16th inch) diameter. 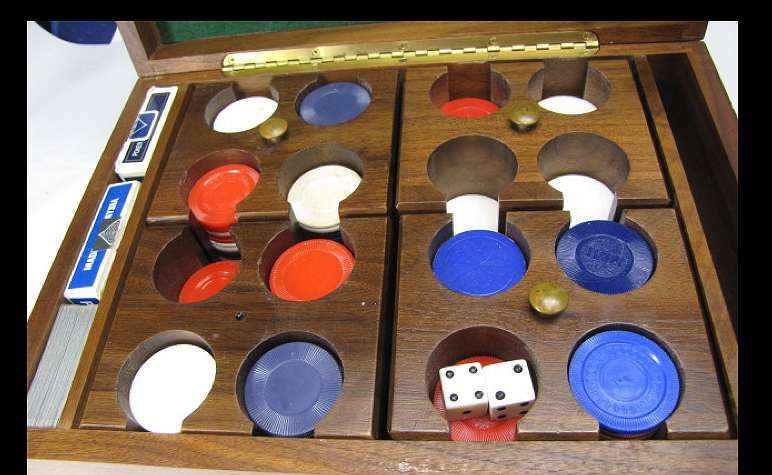 ¶ almost all of the racks have two or more wide slots, which are designed to hold playing card decks. ¶ generally the racks look better "in person" than in the pictures, which tend to highlight every little piece of lint or tiny scratch. ¶ the racks have not been cleaned, dusted, polished, waxed, refinished, etc. I have not applied "scratch cover-up," which can be found in most supermarkets. All of the racks are made of wood. All are antiques, over 50 years old. ¶ the "carousel" racks revolve 360 degrees on their base. ¶ the prices noted below are for the empty racks (no chips). Description -- all are made of wood unless mention otherwise. 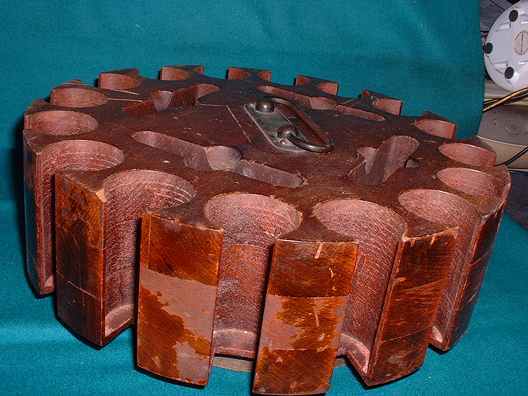 ¶ 480-chip capacity -- a beautiful, rare, oval oak carousel. ¶ wonderful carousel rack. 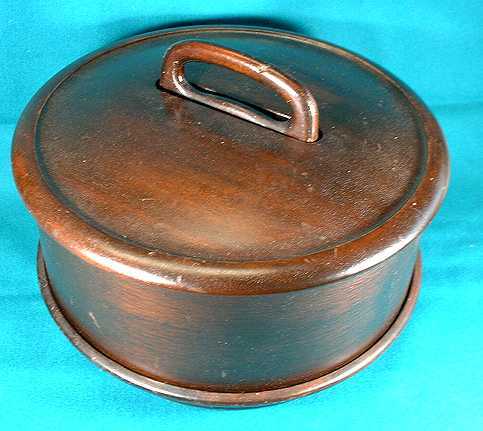 I have literally never seen one like this before -- the oval shape or the carved top and handle (the carved initials are either LBG or EBG, I believe). There are 16 columns, and each holds 30 chips, thus you have a 480-chip capacity. Thus the rack is unique, beautiful and spacious. Size is 14" x 10" x about 9" high, to top of handle. ¶ only defect --and it is quite minor and hardly worth noting-- is some minor blistering on finish and some light scratches. ¶ to view it, click here, here, and here. ¶ 250-chip capacity rack PLUS 1925 Ferguson Bros. Mfg Co. CATALOG showing this rack : 1925, rare and wonderful -- both the carousel and cover are made of mahogany! ( Each column holds 24 of the thick square-edged inlaid chips, and 25 of the thinner more usual poker chips, and there are 10 columns.). Note: the catalog you will be getting shows and pictures this identical rack (mahogany, wood cover, etc.) 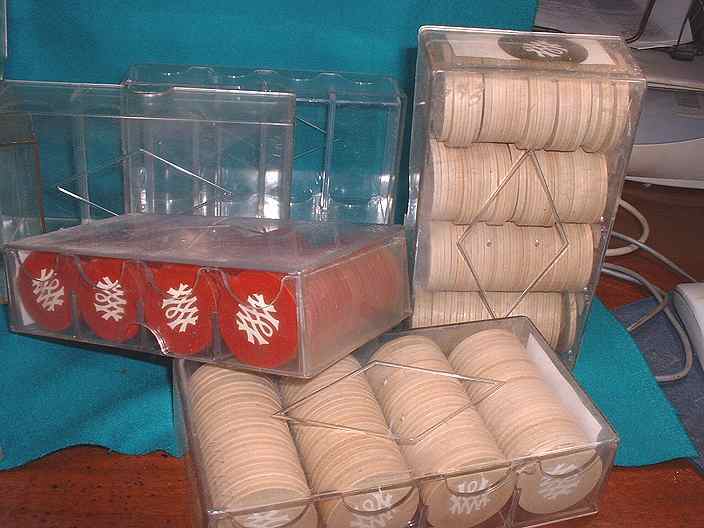 for the 300-chip capacity rack (sold for $24 then in 1925, empty of chips) and the 400-chip capacity rack ($30). That was quite a lot for 1925 dollars! ¶ this is one of my favorite racks. I have one (a 400-chip capacity one) in my personal collection. 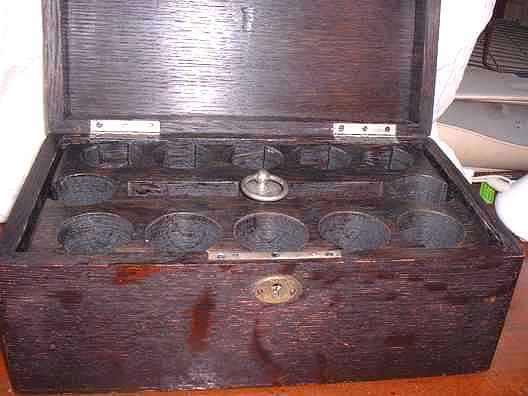 It is made of mahogany (both the rack and the cover! 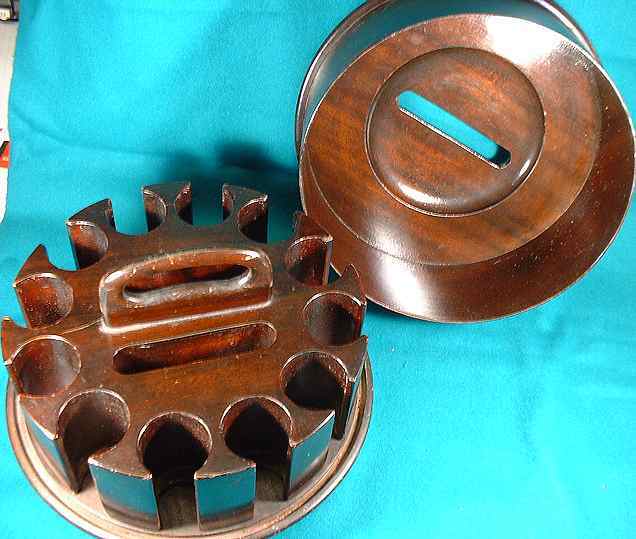 ), made by the Ferguson Brothers Co. of Hoboken , New Jersey, about 1925. The carousel spins on a bunch of small ball bearings! Look here for more about the company and racks. ¶ 250-chip capacity. 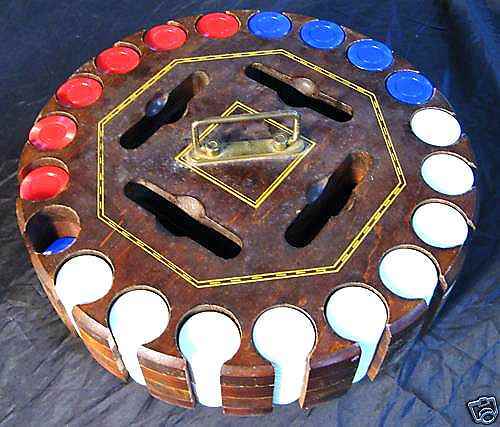 Each column holds 24 of the thick square-edged inlaid chips, and 25 of the thinner more usual poker chips. 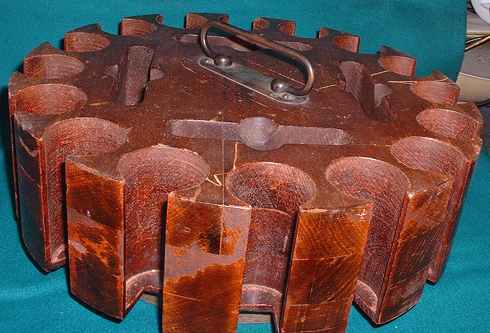 The rack is 8" across. ¶ generally nice condition. Some scuffs, not unusual for its age. As the pictures show, there is a small piece of wood missing at the bottom, and near it, a small piece of wood has been glued. Those things do not affect functioning or basic structural integrity of the rack, and are hardly visible. The wood cover is very fine. I often find these racks badly cracked, large chunks missing and the ball bearings missing -- not this one! ¶ to view it, click here, here, here. and here. ¶ this one has a nice old-fashioned look to it. 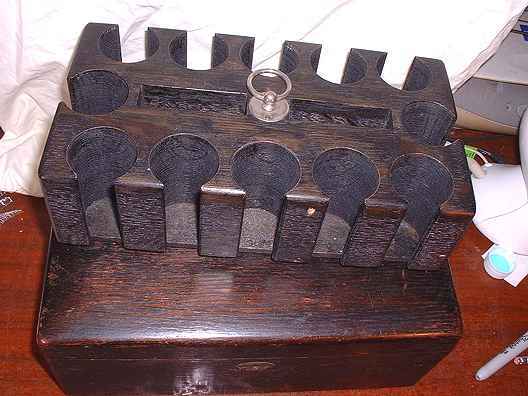 The rack is wood and covered by faux leather. The cover is mostly cardboard with a faux leather skin. (There is a base that I will sell with the rack; it is not seen in the pictures, not worth keeping. Originally, two straps on the base would snap onto the sides of the cover, but no more. Not obtrusive. ¶ to view it, click here, and here. ¶ the brass handle depicts a Chinaman inside a Chinese junk. 11" x 7" x 3." ¶ nice condition, no problems. Much, much nicer than the picture -- nice dark wood with small hints of lightness. ¶ to view it, click here. ¶ used condition, but OK. Metal handle is rusted some, but can be unscrewed and polished. ¶ 9" x 7" x 3." 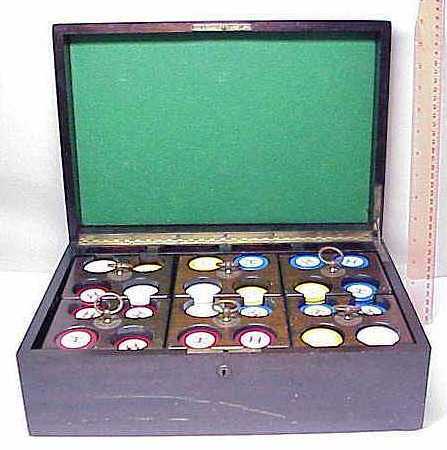 ¶ 300-chip capacity rack-in-chest, with working lock and key. (Each column can hold 25 inlaid chips.) It is wood, made of oak or similar wood. ¶ 10" x 5" x 5." ¶ nice condition, the usual minor scuffs. 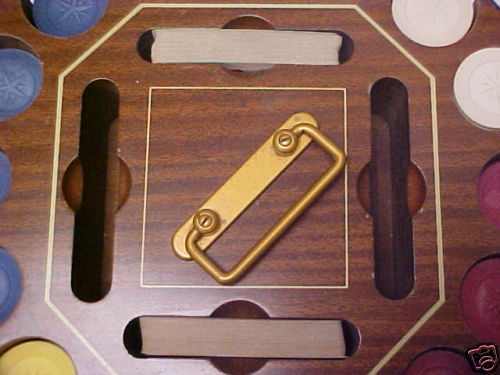 There is a small white nick in the front of the pull-out wood insert as shown in the third picture. 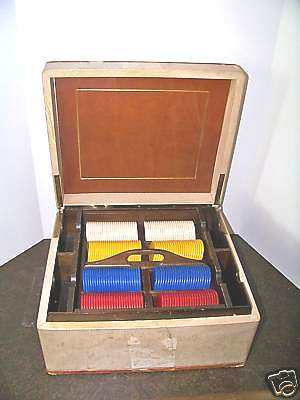 ¶ 200-chip capacity rack-in-chest, with original working lock and key. (Each column easily holds 25 thick Square-edged inlaid chips.) Green felt lines the inside lid. 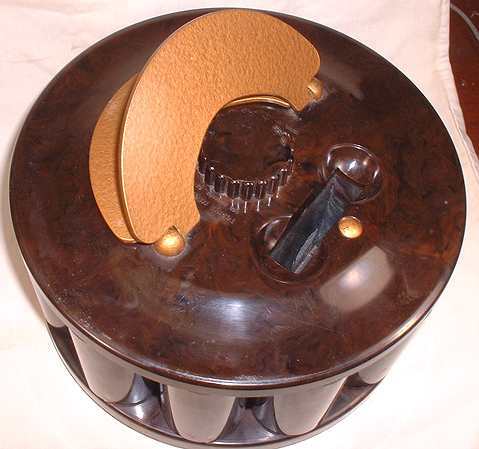 ¶ nice condition-- polished dark brown wood. 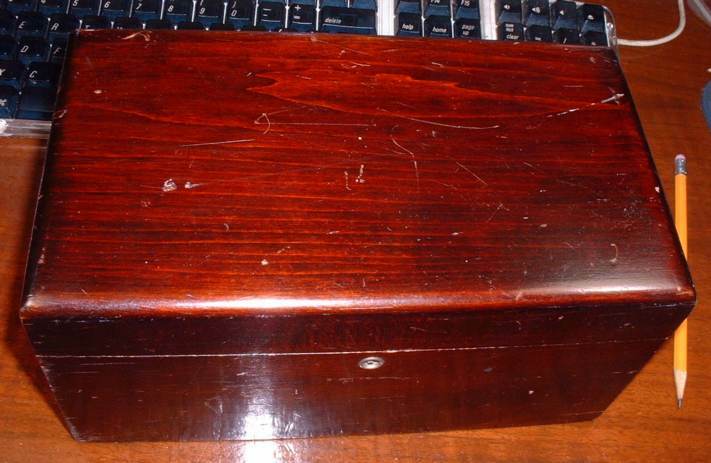 Some surface scratches and dents on outside top lid, as seen in the pictures. ¶ to view it, click here, here, here, and here. ¶ 15" x 11" x 6." 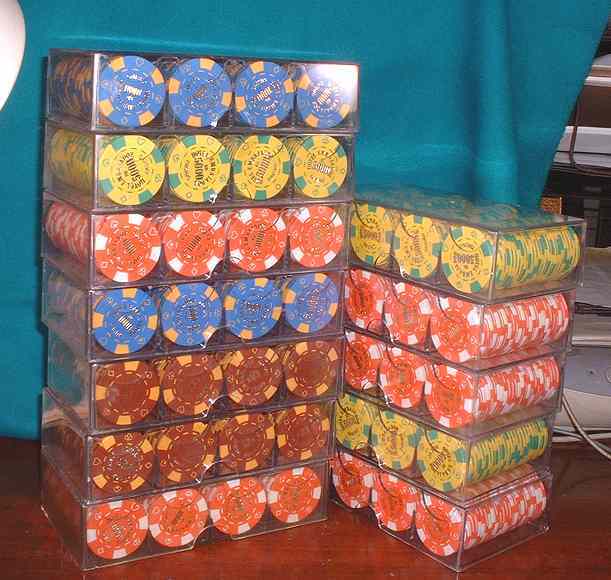 Each stack accommodates 25 round-edged and square-edged chips. For certain particularly thick square-edged chips, the top chip is half-way above the top of the rack -- no problem. ¶ very fine condition. The only "problems," which are really minor, are: the usual dings (shallow dents) most notable in outside top of rack (seen in the second picture above); key does not work the lock, but mechanism there to be repaired if you wish; and small chunk of wood missing from one of the four 100-chip racks (seen in third picture above). 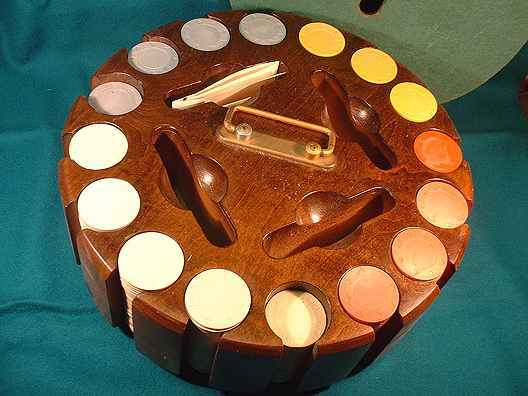 The latter is not as disconcerting as it might seem at first -- the defect can not be seen from atop when the lid is opened, and that 100-chip rack holds all 100 chips securely even with the missing wood chunk, that is, it holds the chips as well as the other three 100-chip racks!. ¶ this is one of my favorite racks. I have one (a 400-chip capacity one) in my personal collection. 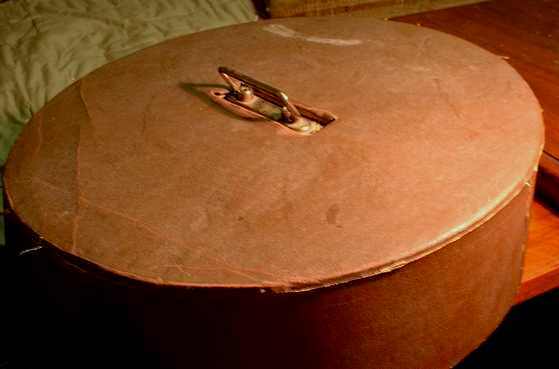 It is made of mahogany (both the rack and the cover! ), made by the Ferguson and Brothers Co. of Hoboken , New Jersey, about 1925. 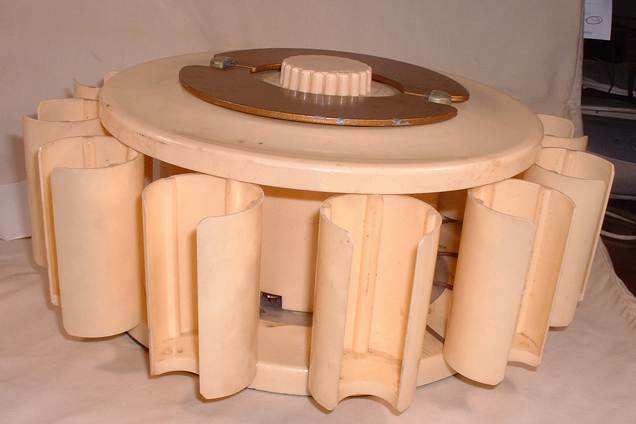 Unlike most Ferguson racks where the carousel spins on a bunch of small ball bearings, this one spins on four small rollers between the rack and the base. Look here for more about the company and racks. Also, see the story for Rack #2, above. 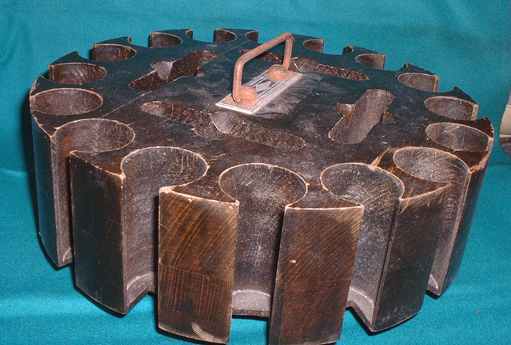 ¶ 11" across, about 6-7" high. ¶ very fine condition; no problems. ¶ 400-chip capacity carousel. (Each column easily holds 25 thick square-edged inlaid chips.) 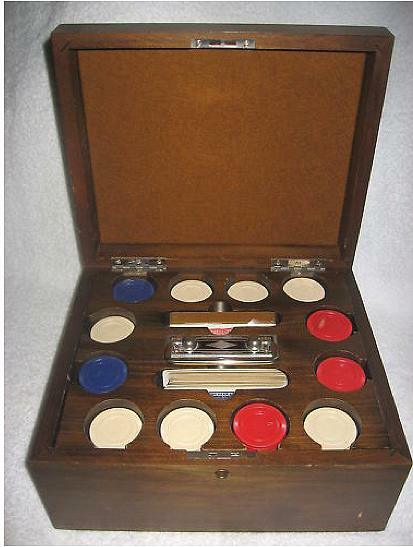 Comes with an imitation lather, worn dust cover (not shown in the pictures). Cover is not needed, consider it a free extra. ¶ Beautiful antique wood carousel. Vintage, but mint! No problems. 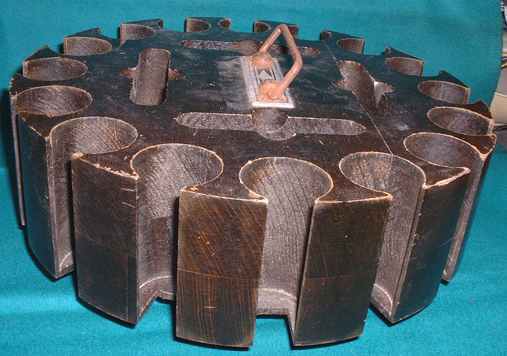 ¶ I have other 16-column, 400-chip capacity old wooden carousels for sale, for less money, lesser condition. ¶ fine condition, no problems, save some rust on handle (you could unscrew it and polish it). ¶ Rack-12g: green color -- fine, no problems other than a small tear drop-size discoloration on the top of the rack, probably from the manufacturing process; not really worth mentioning -- $95.00. To view it, click here. 12-g has been sold. ¶ Rack-12w: white color -- extremely unusual for this rack is to be found in white! Also highly rare, is that this rack has the patent date (see above)! Works fine. Plastic is a little discolored in places from scraping. The worst side is shown in the picture -- $135.00. To view it, click here, and here. 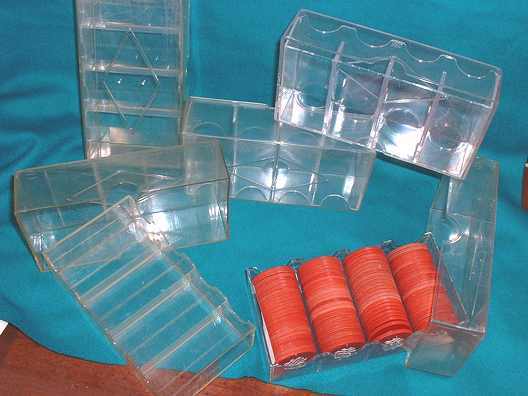 I could also sell you a 100-chip capacity plastic, transparent chip box (very box-like and stackable) for $3.00 each. I strongly recommend these boxes -- they are economical. sturdy and flexible. They hold the most chips in the smallest odd spaces than any other chip holding device. This is obvious, but I'll say it anyway: the transparency of the boxes is a great feature: you can quickly see what chips are inside, and you can hang a nice label inside at the end of the bottom piece and see it from the outside through the top piece. To see pictures of these, click here, here, and here. ¶ Very nice oak or walnut 600-chip capacity rack. I have another one in my personal collection. Scarce. 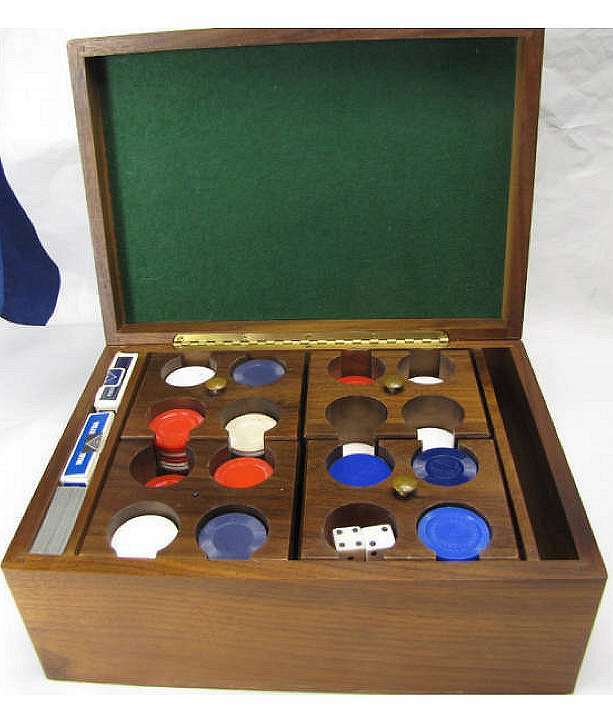 Neat feature is that the box contains six individual removable 100-chip capacity racks inside! Working lock and key. Green felt inside the lid. 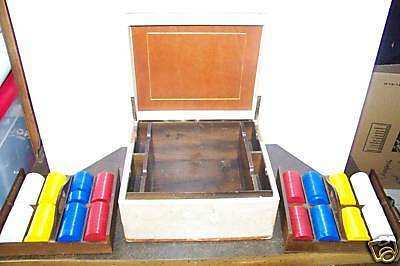 Spaces for 4 decks of playing cards. 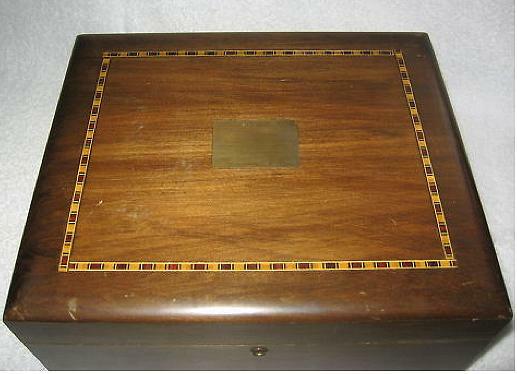 There is a rectangular brass plate atop the box that is intended for an engraved name, but is blank (unengraved) at present. Sold empty of chips. Click here and here for large pictures of the rack. 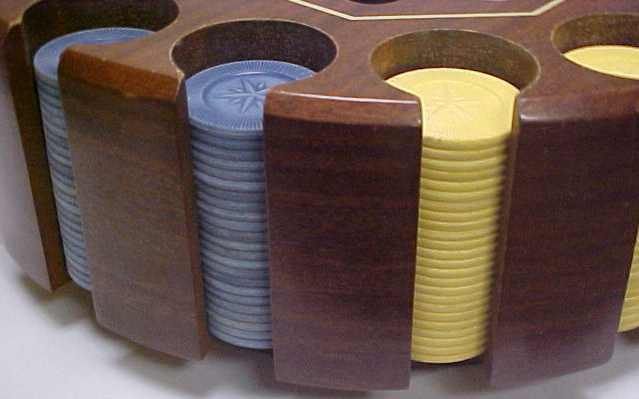 ¶ The rack is perfect for the usual round-edged poker chips. 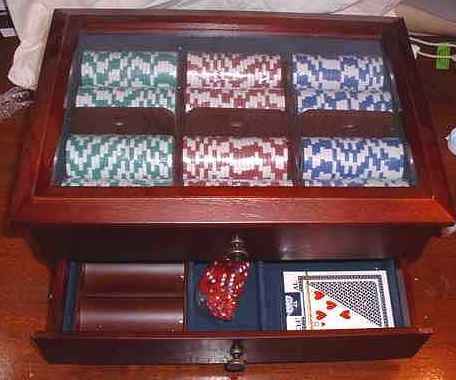 Each column easily holds 25 chips with even some extra room to spare. But when I put in square edged chips, 24 chips almost completely fill the column; there remained the tinniest space to barely hold the 25th chip. ¶ generally nice condition. 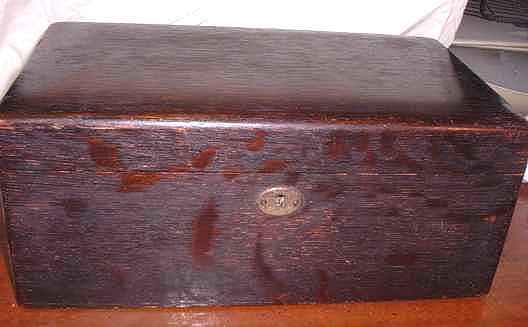 Only major "problems" are scratch in front and two stains on top -- seen in the pictures. Those stains are a little worse than the picture shows. You might want to refinish the surface, though not so bad as it is. One other matter is that five of the individual racks are original to this set. The 6th one (on the right side of the second picture) is the same size (and probably the same manufacturer) but is from another set and a little different and darker. Note: the three individual racks atop the box are not hiding anything -- the finish is fine under them. ¶ This is very modern 400-chip capacity carousel rack (16 columns that can take 1-9/16" chips). 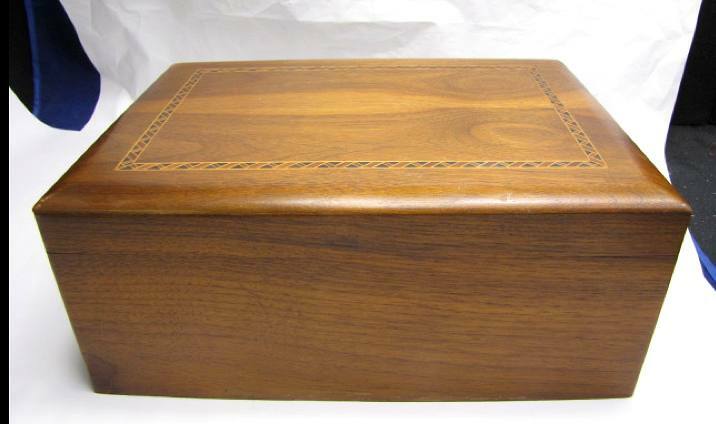 Excellent condition — a quality dark brown wood — one or more of the pictures shows the flat wood cover (green felt underneath). Very heavy, solid, impressive, beautiful rack -- sleek polished wood, rounded edges. Turns smoothly. No defects. 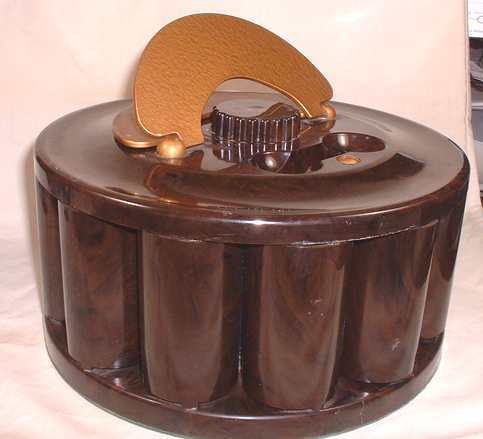 400-chip capacity carousels are rather scarce. ¶ large pictures of the rack: click, click, click, and click. 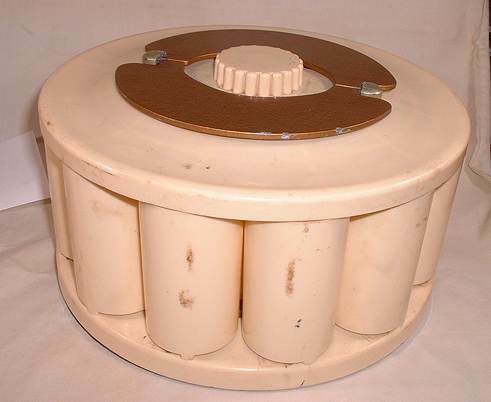 ¶ 400-chip capacity vintage carousel (16 chip columns that can accomodate 1-9/16" chips). Comes with an imitation leather cardboard cover (not shown). Diamond design on the handle. Rack looks better than pictures. ...... While pictures may not show it, the finish is quite nice, no problems of note; I wouldn’t bother to refinish it. Only “problem” is that the handle is rusted (see the pictures). You can easily unscrew the handle plate and polish it, then screw it back in. Dark finish — sort of blackish brown. 400-chip capacity carousels are rather scarce. ¶ large pictures of the rack: click, click, and click . 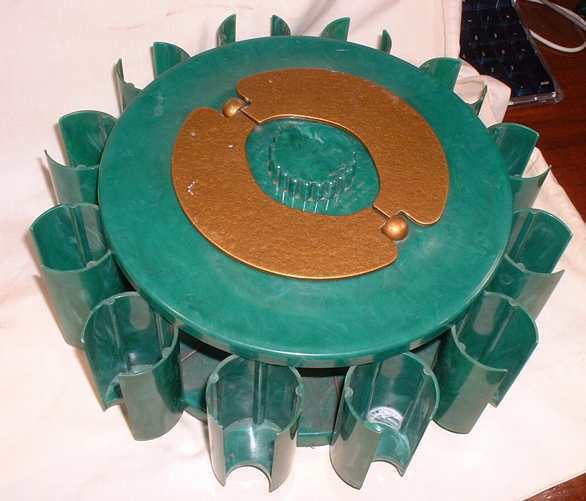 ¶ another 400-chip capacity vintage carousel (16 columns to house 1-9/16" chips). Carousels this large are rather scarce, and they are very serviceable for chip storage. This rack has its finish shot in places, but is very intact — no chunks of wood knocked off. Just one very small nick on the edge of one column. 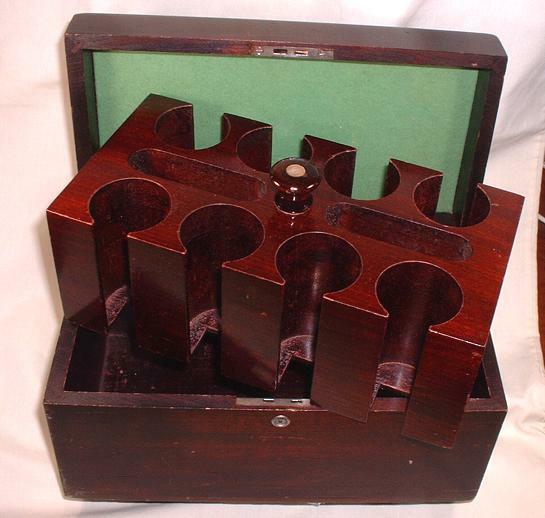 ¶ large pictures of this rack: click, click, and click. .
¶ capacity -- each column can hold 27 of the usual round-edged poker chips, and 23 or 24 of the old and modern squared-edged, thick club and casino chips. ¶ pictures -- rack and cover are nicer than the pictures look -- could use some furniture polish/cleaner -- click here and here . ¶ condition -- quite good. The rack had a small piece cleanly knocked off at the bottom of one of the columns, but has been nicely glued back so you couldn't tell what happened from the outside (because the separation occurred where one layer of wood joined annother layer (see the first large picture to see the layers of wood) . .. ... ... The imitation leather, thick, sturdy cardboard cover has also been glued/repaied very nicely. Only real "problem" is a few-inch light stain on the top (seen in second picture above). 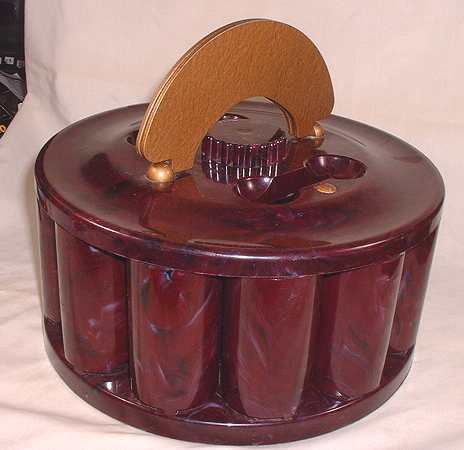 ¶ 400-chip capacity (holds 1-9/16" chips, chips not included). 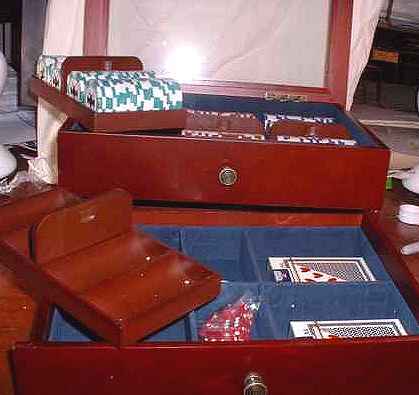 The wood chest contains two pull-out wood racks, each holding 200 chips. 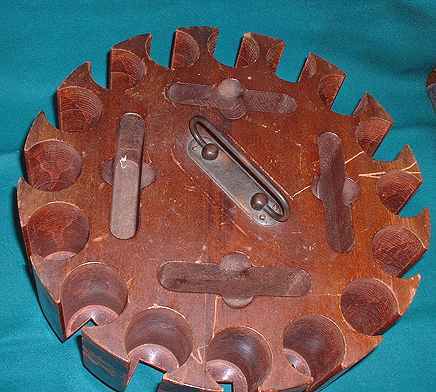 Altogether there are 16 rows -- holds 25 standard round-edged chips per row, so holds 400 chips total. If you are using the thick square-edged type chips, each of the 16 rows will hold 24 chips. ¶ this vintage rack (must be at least 50 years old) is being sold at a bargain price because (a) I acquired it for very little with some chips, and (b) there is one "problem:" the outside of the chest seems to be covered with a paper that is imitation leather (leatherette, I suppose) that is soiled some, frayed mainly at the wood edges, and there is some residue of removed tape in two places. 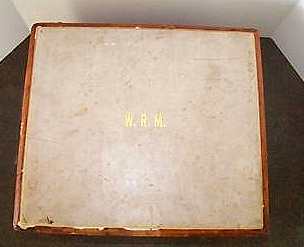 There are professionally applied "W.R.M." gold initials on the top. This was originally an expensive, top of the line rack, and today it is perfect and sturdy (no warping, cracking, etc.) except for that outside lining problem. You may want to refinish/recover the outside, though you may leave it as is. 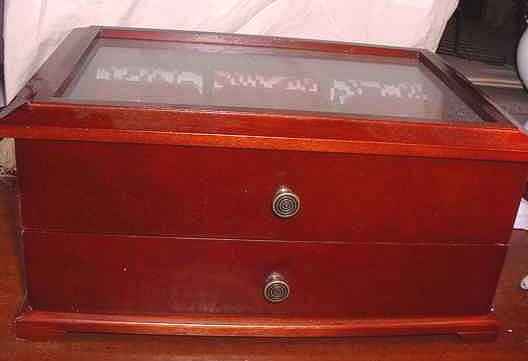 ¶ Pictures: open, two pull-out racks w/ handles; top one is visible , chest is empty as the two-pull-out racks are on both sides , and top of closed chest; note the "W.R.M." initials . 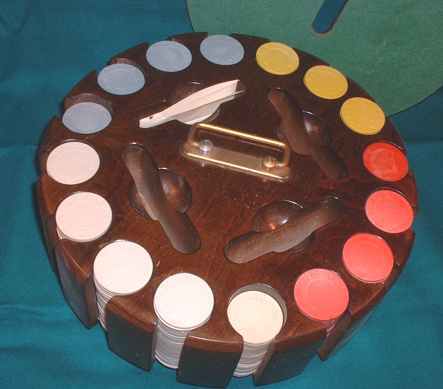 ¶ Caddies: There are two removable wood caddies that fit inside the case (chest). Underneath each caddy is a brown velvet. The caddies seem to be of mahogany but I am not sure. The two caddies hold 200 chips each - so four hundred total. 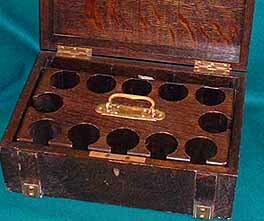 The caddies slide in and out of the case with no resistance, no warping to the wood. 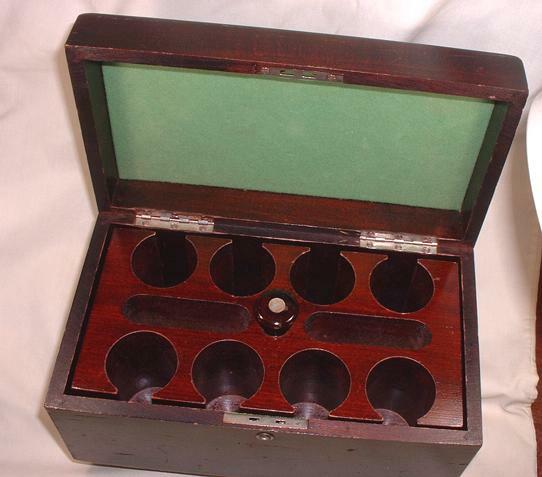 ¶ Rack (case): Measures: 10 1/4 Long x 9" Deep x 5 1/4" Tall. 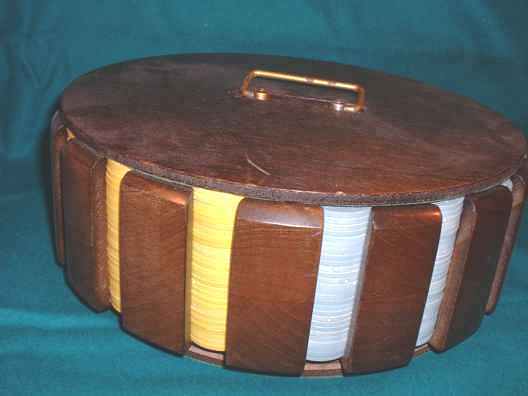 The case is lined with the same wood the caddies are made of. 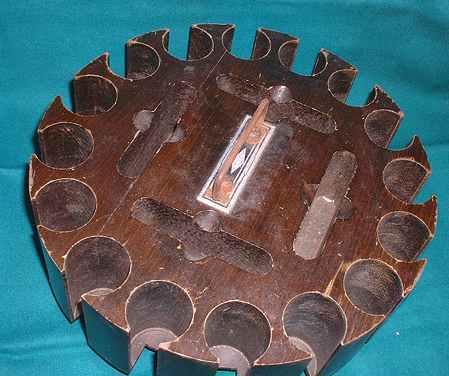 The underside of the top has a leather or leather looking cushion back. Designed to look like leather - could be but I doubt it. 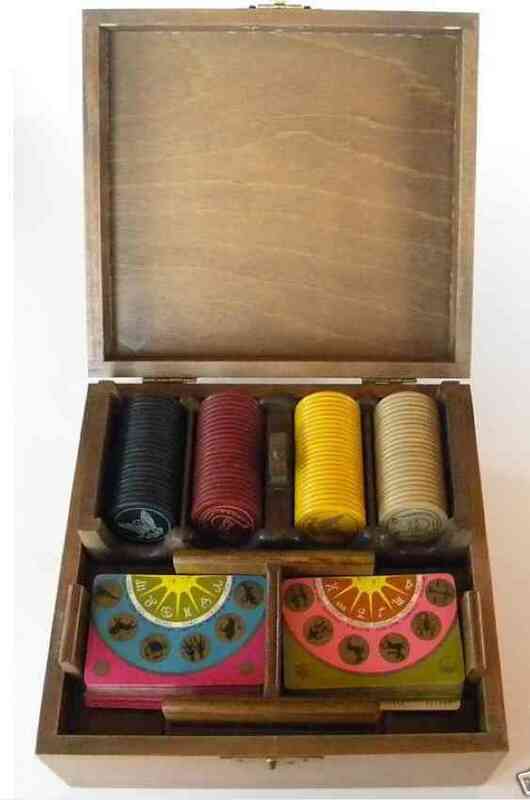 Four slots for playing cards. 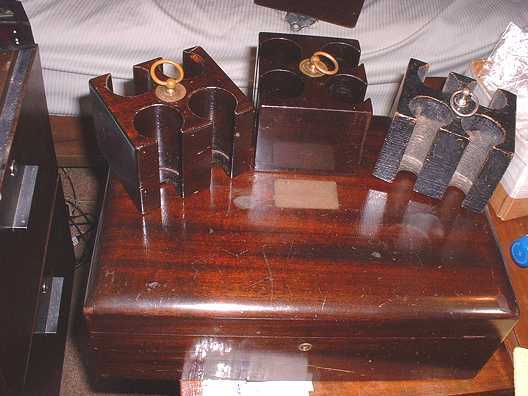 ¶ Hinges: are brass and are in superb condition - there is a brass plate (piano hinge) that runs along case from end to end, plus there are two metal movable supports to hold the lid erect. ¶ 300-chip capacity. 9" x 9" x 4." 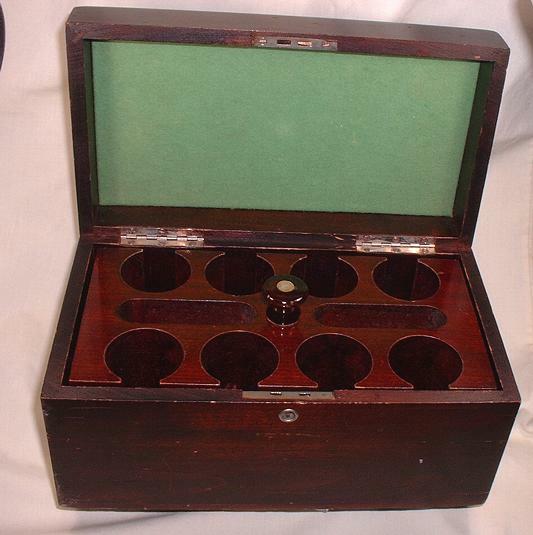 Contains 4 removavle wood trays -- 3 for chips and one for playing cards. There is a simple closure latch to "lock" it shut. (Chips and cards are NOT included.) A bargain at $35.00. ¶ click here and here for more pictures. ¶ very fine condition. Some very light scratches on outside of box -- nothing disarming or particularly noticeable. ¶ 12" x 9" x 5." ¶ large pictures of the rack: click here, here, and here. Note the attractive wood inlay around the top of the rack. ¶ Very good condition. 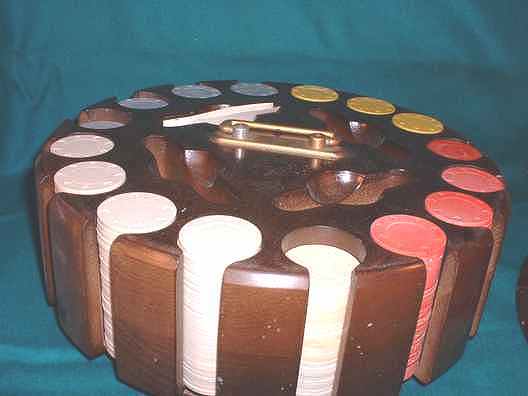 There are the usual few minor dings, and the only other thing of note is that (as seen in the pictures) one of the four finials (knobs) for the 100-chip racks is missing. It doesn't show in the pictures, but I have added a small hook screw as a finial, and you can easy buy a new set of four small screw-in finials, sold for very little at hardware, firniture and art supply-hobby stores. ¶ 300-chip capacity rack. Very nice, gorgeous; no problems. Good choice. 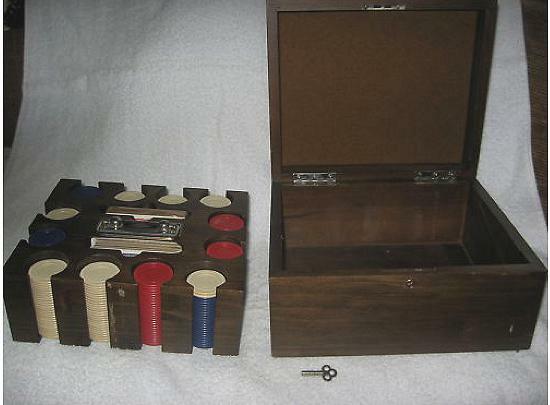 Among its features are: pull-out block rack with 12 "holes" for 300 chips, large brass nameplate on top of lid (blank, unused), wood inlay design on top of lid, brown felt on inside of lid, green felt bottom, spaces for two decks of playing cards, and working lock and key. ¶ large pictures of the rack here, here, and here. ¶ 10" x 8.5" x 5." ¶ excellent condition. There were a few minor scuffs on rack when I took the pictures. Since then, I have eliminated them all with Old English "scratch cover." Looks great.